After Super Zombie Tennis, which is still our very first step in the big shiny AppStore world, we are going to start our new Project. One thing we learned from SZT is that publicity is a very rare and powerful resource. After reading several articles about Indie-Marketing i found this – Video – very interesting Video onPixelprospector. Brian Baglow shares some insides on Big-Game marketing and proposes some interesting ideas. His main point is to showcase your Project as early as possible to your Users. Give insights and involve them in your thoughts, let them see what you do and going to do. In that way you can build a “Fanbase” around you project as early as possible. In the best case scenario those Fans will do all the marketing for you by spreading the word. The “only” thing you need to do, is to deliver the most awesome Product! 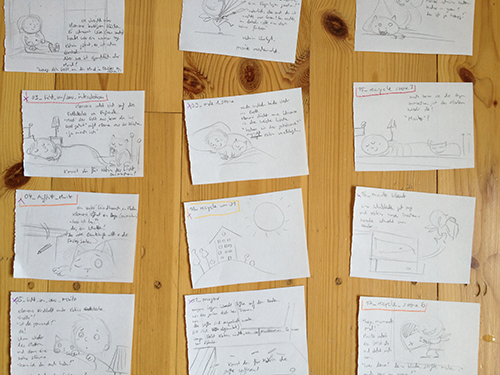 The very first step we took is to do a physical storyboard to get an general overview. We are planing the amount of screens we are going build and mark several scenes for reusing assets or backgrounds. In parallel we already setup the basic gamelogic of one of the Mini-Games we’ll implement. This Prototype is already usable and has some basic Gamestates. In the Picture you see a basic setup where you have to order crayons by their color. 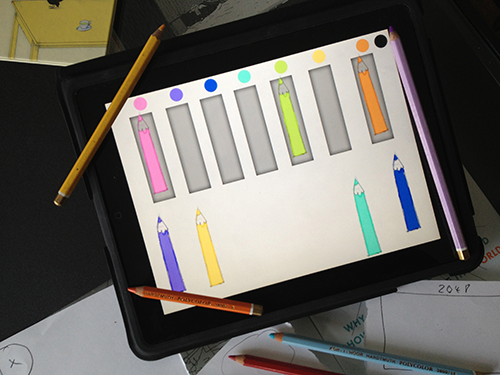 The cool thing is that you can replay this game, because we can randomly shuffle the crayon colors around. 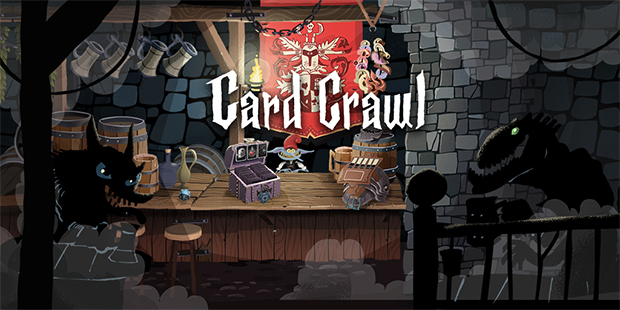 Our goal for the project is to setup a basic storyline which is fixed and support it with dynamic parts, such as those Mini-Games which will enhance the Story with some replay value. We’re going to post updates on the development here on our Blog. You can also follow us on Twitter @tinytouchtales. We are super happy about our new Project and we hope we can delight you in the future.